Successfully Added Unlocked Quad Band Dual SIM TV World Phone + Bluetooth to your Shopping Cart. Unlocked Quad Band Dual SIM TV World Phone + Bluetooth. Our brand new M23 features an easy to use touchscreen display and tons of multimedia entertainment options, all packed into an attractive, comfortable design. With dual SIM and dual standby, you can enjoy using two active phone numbers at the same time. Take this unlocked quad band phone with you wherever you go, anywhere in the world. The ability to pair with Bluetooth devices for hands free calling gives you even greater convenience. What more could the frequent traveler want? No matter whether you use the M23 for business or personal use, with this phone at your side, you will never be bored again. Use the digital camera to take videos and pictures of you and your friends. Play MP3s and videos, enjoy analog TV and FM radio, and record sound and TV wherever you go. All this on a phone that still fits in your pocket! Customize your phone by choosing your own wallpaper, screen saver, power on display, power off display, clock and hotkeys. Then personalize your phonebook by assigning pictures, music and videos to your contacts and contact groups. Buy an M23 Unlocked Quad Band Dual SIM TV World Phone + Bluetooth at our unbeatable factory direct price, or buy more to save more! We'll send the phone right to your door or dropship it directly to your customers. Straight from your best source of high quality, low price electronics, Chinavasion. 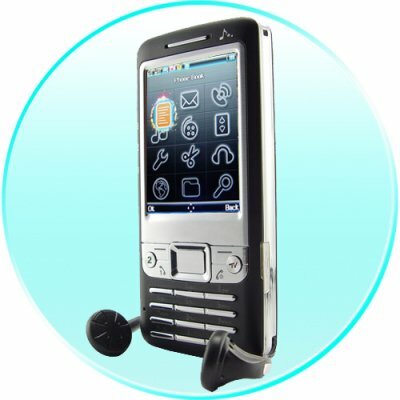 Quad band touchscreen cell phone for worldwide business and personal use. Dual SIM, dual standby, and hands free Bluetooth. Features tons of entertainment options. - Choose your own: wallpaper, screen saver, power on display, power off display, dedicated keys, clock type and password. - Assign music, video and pictures to contacts and contact groups.